Complaint, after complaint, after complaint! This company is the WORST! Avoid Farmers Insurance Group! 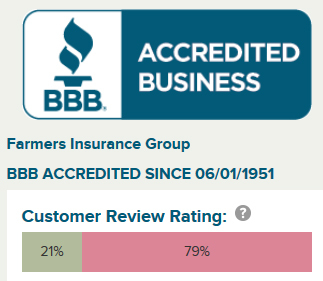 Seventy-nine percent of reviews submitted to the Better Business Bureau (BBB) of Farmers Insurance Group are NEGATIVE! Farmers Insurance had 213 complaints in the last year and 643 complaints in the last three years! Do you want to deal with a company with that many consistent complaints? Read some of the complaints below. “I have been paying for insurance for my rental home through Foremost/Farmers for 5 years. Never one late payment in that time. I had some renters who did significant damage to my rental home. I met with my agent and he initially said they would cover $8000 dollars for the damage. That $8000 turned into $2000 once I received a copy of his report. He then called me a week later and said that they reviewed the policy again and found a loophole to where they didn’t have to pay anything. They put a stop payment on the check and now refuse to return my phone calls. I had a $35000 policy and they are giving me nothing. Please do not do business with this company. They are frauds and thieves. The only good news is that after I contacted an attorney, he says that I have an extremely strong case. Hopefully I can get some of the money back that I have paid them for 5 years. “Recently totaled my 2003 Z71 Tahoe. The mileage on my vehicle with just 190K, it was in immaculate condition with no issues. Insurance came back and told me they were willing to give me $4500 for it. This is absolutely ludicrous as of this particular vehicle will cost about $9500. For what they are offering me, I cannot even replace my vehicle with the same exact vehicle in the same condition. Their offer will not even cover half of what they’re going for. They say they are going based off blue book value but would consider upping it if I can show them proof that these vehicles go for more in this area. “I had someone rear end my 2012 Jeep Grand Cherokee over a year ago. Farmers paid for the repair with no problem. However, under Oregon law you are also entitled to receive compensation for “Diminished Value”. 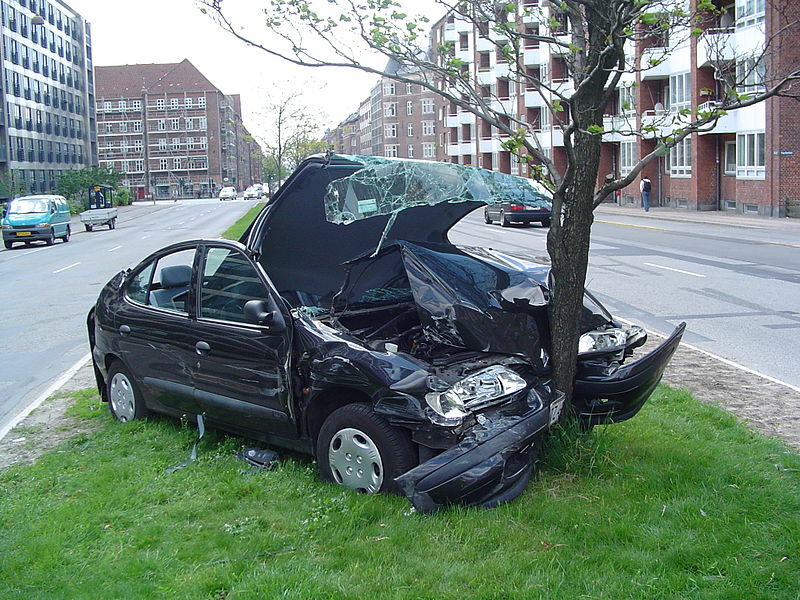 An accident will lower the resale value of your vehicle no matter how beautifully the repair was made. That’s diminished value (or DV) and you are entitled to compensation for that additional loss. I had two DV estimates done by reputable companies and they both estimated that loss at over $5,000. You pay these companies to do this estimate and you have no idea what they value your loss at until you pay them and see the report. They get paid the same either way so there is no incentive for them to lie or inflate the value of the loss. It’s an honest assessment. Farmers came back and said their expert valued the same loss at no more than $2,000. I refused the $2,000 and they came back with $2,250. “Farmers Insurance has been the worst experience of my life. I was sideswiped by one of their client who was ticketed for the accident. I was traveling eastbound in the curb lane at the posted speed limit. The Farmers client made an illegal left turn into the center lane of the same street as me and then abruptly made a lane change into my rear driver’s side door. The Farmer’s customer raced through an expired left turn arrow and lost control of his vehicle due to excessive speed. Farmers lied and said I turned right on red which is patently false. What happened was their client made an illegal left turn AFTER the left turn arrow expired and then about 5-6 car lengths down the road struck my vehicle. Suffice it to say, Farmers Insurance are liars, cheats and swindlers. “I have had auto/home insurance with Farmers for 15 years. With few if any claims I have been responsible for. In all auto related issues concerning disputes my Farmers agent in Santa Rosa consistently took the side of the company. The customer service has gone downhill over the 15 years. Recently my agent informed me I would be paying a increased premium for my Subaru WRX 5door hatchback. He said it was in a “performance/sports car” category. When I requested Farmers policy documentation details indicating a list of “performance/sports car” data it was not provided. When I contacted the Farmers District Manager he also refused to provide the information. I have an outstanding driving record. Assigning an extra insurance premium on my Subaru has nothing to do with my record. Cars do not break the law! People do! The “performance/sports car” category has nothing to do with my driving record. “I’ve been working with Michael ** from Farmers Insurance for the last 2 weeks and HE’S THE ABSOLUTE WORST. 2 weeks ago one of their insured hit me when he ran a stop sign at an intersection, doing significant damage to my car. The front passenger side was completely bent in, leaving a big gap with an air bubble. I called them and asked them to send someone over to do an estimate and Michael told me they don’t usually do that unless the car isn’t driveable, that I’d have to go to a shop and have them do it. I tried to explain to him that the car ISN’T driveable, that I just don’t feel safe driving it in its current state but he just didn’t care and insisted I had to bring it to a shop to get an estimate. I finally found a shop that could accommodate my schedule and location and they took a look at my car and told me I need to call Farmers and tell them to give me a rental, because this car isn’t driveable. Only then did Michael set me up with a rental. After I got my rental from Enterprise, they told me that Farmers refused to cover my damage waiver on the rental because my insurance already covers a lot of that. I called Michael and asked that Farmers cover my damage waiver and surprise surprise, he said they don’t usually do that. I pointed out that the accident was 100% their driver’s fault and he said OK, they’ll cover my damage waiver but first I have to get my insurance company to fax them a copy of my declaration.